Why would I need self storage in Sunny Isles Beach, FL? There are a variety of reasons why you might need self-storage in Sunny Isles Beach, FL. How much is a storage unit in Sunny Isles Beach, FL? The cheapest storage unit in Sunny Isles Beach, FL is $80.00 per month. What size storage units do you have available in Sunny Isles Beach, FL? In Sunny Isles Beach, FL we have sizes that range from 5'x5' to 10'x20' to suit your storage needs. How much is it for a 5'x5' storage unit in Sunny Isles Beach, FL? The cheapest 5'x5' storage unit in Sunny Isles Beach, FL is $80.00 per month. Sunny Isles Beach is a Floridian city nestled between the Atlantic Ocean and the Intracoastal Waterway. Nestled on a barrier island, the city has a relatively small population that's augmented by a regular flow of tourists drawn to its idyllic tropical location. With just half an hour between Sunny Isles Beach and downtown Miami, the city offers easy access to the excitement of Miami from a somewhat quieter community. Sunny Isles Beach was first envisioned as the "American Riviera" by investor Harvey Baker Graves in the 1920s. He purchased the land where Sunny Isles Beach now sits and slated it for development as a luxury resort. The Haulover Bridge made the area easily accessible from Miami Beach, and many developers were attracted by the potential for success. In the 1930s, the resort was purchased by Kurtis Froedtert of Milwaukee, who had found major success in the malt industry. He built the Sunny Isles Pier, which quickly became a hot spot for tourists. During the mid-20th century, a number of hotels and single-family homes were constructed in Sunny Isles Beach. Most of the hotels were concentrated in "Motel Row" and offered themed rooms that attracted many tourists. Today, Sunny Isles Beach is still a major tourist destination, but it's also evolved into a permanent residence for many people. Among the obvious major attractions in the city are its sandy shoreline and year-round warm weather. Water sports, including snorkeling and deep-sea diving, are popular in the area, and the Newport Fishing Pier offers scenic views and plenty of good fishing spots. You can rent Jet Skis and kayaks at the beach, or spend time in one of its many comfortable cabanas. Aside from the beach, Sunny Isles Beach features 11 community parks, a community center and a branch library in its small footprint of just 1.25 square miles. The city offers both youth and adult athletic leagues as well as recreational programs for senior citizens. When the local schools are closed for seasonal breaks, day camps are a popular option for many families. The city's Cultural & Community Services Department also plans a number of group trips for locals, highlighting nearby destinations, including art museums, professional sports games and shopping malls. Public school students in Sunny Isles Beach attend elementary school in Sunny Isles Beach, middle school in North Miami Beach and high school in North Miami or Miami. There are also several private schools in the Miami area that serve students from Sunny Isles Beach. 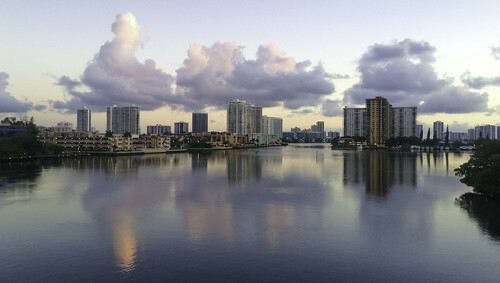 Utilities: Florida Power & Light, TECO People's Gas, the city of North Miami Beach and Miami-Dade County all provide utilities to Sunny Isles Beach. Garbage and Recycling: The county facilitates twice-weekly collection of trash and recycling. Items are collected curbside for all single-family homes. Transportation: Miami-Dade Transit operates several bus routes through Sunny Isles Beach, including a number of stops throughout the city. The SIBshuttle is a free community shuttle that provides transportation to and from the local hospital. Resident ID Cards: The city issues resident ID cards that are required for participation in many community services, including recreational programs. For a beachfront city, Sunny Isles Beach is actually quite affordable. That being said, you can also find plenty of multimillion-dollar residences, especially those with easy beach access or ocean views. The median home price is well above the national average, but that's not surprising given its coastal location. Many local housing options are apartments or condos in beachfront high-rises, but there are also options slightly farther from the water. Our lowest priced units in Sunny Isles Beach, FL average $80.00 per month. 49 people have reserved units in Sunny Isles Beach, FL in the past 30 days. There is 1 location within Sunny Isles Beach, FL's city limits. There is 1 location in Sunny Isles Beach, FL that offers AC and Heating features.